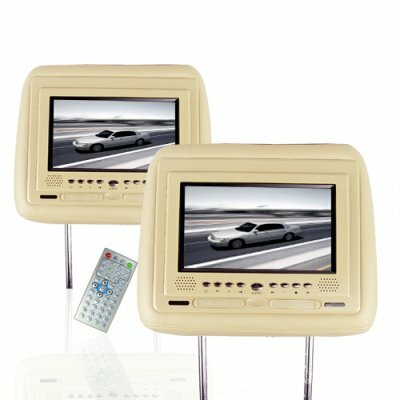 Successfully Added Car Headrest DVD TV Player - 7 Inch TFT Screen -Pair -Tan to your Shopping Cart. Car Headrest DVD TV Player - 7 Inch TFT Screen -Pair -Tan. TV Tuner and DVD Player put into one beautiful artificial leather headrest with a high quality 7 Inch TFT LCD for large and sharp pictures. This luxury headrest will play all of your favorite movies with its impressive compatibility, including MP3/4, and DivX. Also, a USB port and a SD/MMC card reader are included top make playing your digital files a snap. For a great deal on this luxury item, log in and buy in bulk to see how much more wholesale savings you can get. By ordering this item you will receive a matching pair - 2 identical headrests.